Cable Services distribute low and medium voltage cable joints from the market leading manufactures: Tyco, 3M and Prysmian and have over the years acquired a wide expertise in the installation of the whole range of low and medium voltage resin, heat shrink and cold shrink cable joints. 3M cold shrink system, paper and polymeric power cables 6.6kV, 11kV, 24kV and 33kV for paper and polymeric cables. Tyco heat shrinkable jointing system up to 33kV, shrink set resin filled joints up to 11kV and cold applied straight joints up to 33kV. 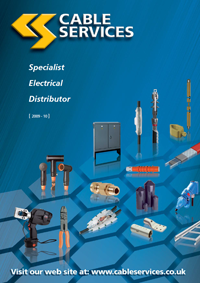 Our vast experience coupled with stocks unequalled anywhere in the UK makes Cable Services the only choice for Low Voltage Cable Jointing and Medium Voltage Cable Jointing products. We are distridutors and stockists of a wide range of resin, heat shrink and cold shrink joints which are listed on our main website. This micro site is an information centre for the range of low and medium voltage cable joint systems that are on the market today. We also have microsites with resource for specific manufacturers information on the range of lv cable joints and mv cable joints where you can find in depth information and specifications.